The ACG System models and predicts an individual’s health over time. Using existing data—from medical claims, electronic medical records, and demographics like age and gender—health systems, health organizations, insurance companies, accountable care organizations, individual clinics, and clinicians gain insights needed to evaluate and compensate providers, stratify risk, identify patients who would benefit from care management, and forecast health care utilization. The ACG System is an organic resource that currently impacts more than 140 million lives worldwide. 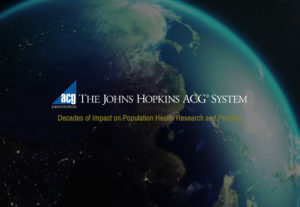 For more than 30 years, Johns Hopkins statisticians and economists have collaborated with users to continually improve the ACG System’s ability to describe population health and transform health care data into actionable information. Please explore the new ACG System website and learn more about its capabilities and applications.